Think back upon all the Leafs games you've attended over the years. Which was your favourite? Five years ago today, I wrote about My Game. This game took place over twenty years ago, but it remains my personal fave. 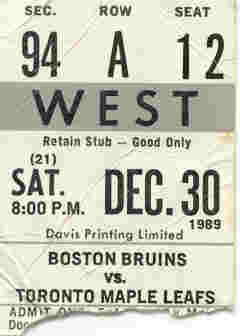 There were 16,382 of us there that night, but nobody left Maple Leaf Gardens happier than I. I had just witnessed a miracle that I'd never forget. Wendel Clark? Did she play with the Leafs? Nose bleed...stub......I have a few. Only for rock concerts! Nice. I think I remember this game. If it's the same one, Kordic threw around his body some in the second period, which behaviour was hailed after the game by all the commentators.